Here’s one of my submissions for the 2005 KALX t-shirt competition. 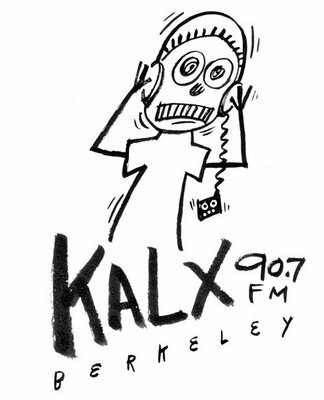 It’s a student run radio station out of Berkeley that plays all kinds of music. The only requirement was to have the radio station’s call letters and name in the design. It’s a really cool station and cutting edge stuff on it. Groovy stuff. 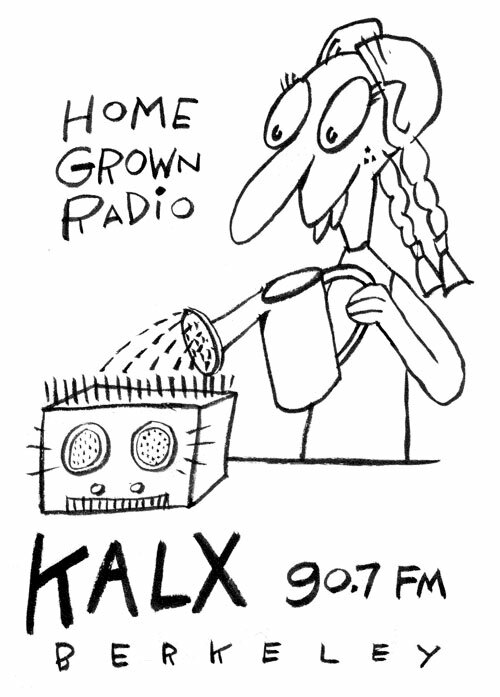 Anyways, I submitted this image for “home grown radio”. It didn’t win, :(, but I still had fun drawing it, :). It started out from a teeny weeny sketch in my sketchbook, blown up, and traced to what you see here. When I heard IF current word: Sprout, it reminded me of this drawing so here it is. Although . . . (please scroll down for more) . . . This design did win! They didn’t make t-shirts out of this one but they did put this design onto thousands of “adhesive stickers”. It was sort of a honorable mention but that’s cool. It was stickers for books, cars, furniture, what-ever the owner’s heart desired. I guess they thought it was a simple enough design that could be easily recognizable from a distance. I was inspired by a “Radio Junkie” and just drew what came to mind. Yippeee. Notice that at that time time, MP3’s weren’t invented yet, so the maniac listens to his Walkman. 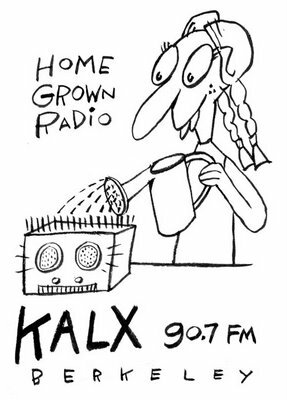 Of course with FM radio so he can listen to KALX. If you’ve got sime time, check it this real hip station: here’s the link. Peace Out! Good, effective drawings! Ahhh, I remember when I was a radio junkie some time ago–the golden age of college radio. Peace.